Evolving Nationalism (EvoNat) Research Briefs examine issues surrounding the rise in sovereignty-based demands among movements based in the stateless nations and regions of western Europe. They are aimed at government bodies, political parties, business, international organisations, media professionals, NGOs and think tanks. The series originates from the research project on ‘The Dynamics of Nationalist Evolution in Contemporary Spain’, funded by the Economic and Social Research Council of the UK. 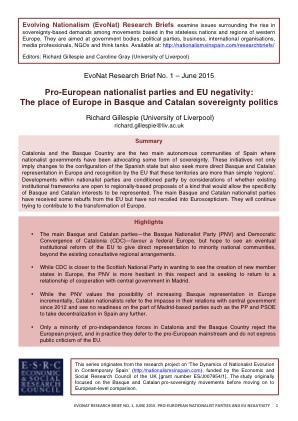 The study originally focused on Basque and Catalan pro-sovereignty movements before moving on to European-level comparison. Series editors: Richard Gillespie (richard.gillespie@liv.ac.uk) and Caroline Gray (caroline.gray@liv.ac.uk), University of Liverpool. We welcome proposals for contributions to the series. See also Evolving Nationalism Research Briefs guidelines.